Since 2004, we have helped over 110,000 people from around the world experience a slice of life through, wondrous, exhilarating, soul-fulfilling whale watching adventures in the spectacular Bay of Fundy. Choose between the famous Historic Jolly Breeze Tall Ship and our new VIP jet boat zodiac or experience both! Voyage past sunning seals, lighthouses and beautiful landscapes to the playground of the porpoise and majestic whales of the Bay of Fundy. Successful encounters with whales exceeds 95% over the past years and report of stomach upset is extremely rare (1 in 3000). The world’s highest tides occur twice-daily and stir up a bounty of food in the Bay of Fundy. This attracts several species of whales during the season from June to the end of October. Extend your stay and take the water taxi over to the remote Campobello Island, visit Roosevelt’s International Park, take a guided van tour of the island and experience island life first hand. (See Campobello Tab). Sailors since 1993, Joanne and Robert Carney welcome you aboard. Classic Tall Ship built in New Zealand, specializing in providing a unique and memorable experience for children, adults and seniors. Ahoy! 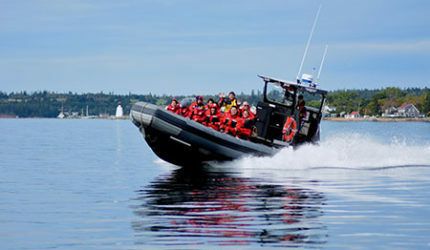 Exhilarating ride on our high speed zodiac to experience the fullest of the ocean salt air and Bay of Fundy wonders. A Slice of Life!